A journalist at Mint, an Indian business newspaper, Sonya Dutta Choudhury is used to going the extra mile for a story. Her newfound passion of long-distance multi-day racing often has her going more than just an extra mile. A recent race led her to submit this entry to Chai Diaries. Sonya Dutta Choudhury, a journalist for Mint, pushed herself to the limit when she participated in the Himalayan Race, a 100-kilometer multi-stage run organized by The WindChasers. Luckily, when the going got tough, a cup of yak milk chai saved the day. 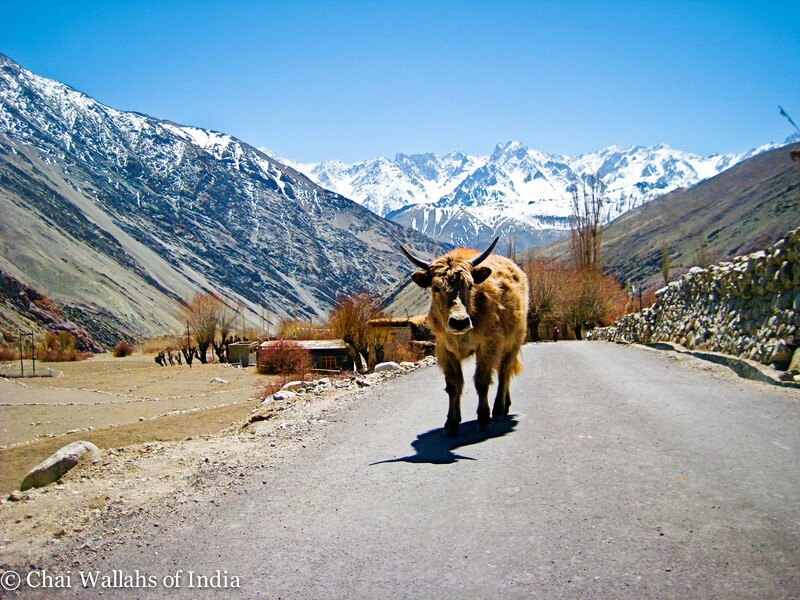 A yak walks down a road in front of Himalayan mountain peaks in Ladakh, India. It was cold in the mountains that September, more so than was usual. There was rain, and with it mist, that made our progress difficult. We found ourselves stranded. Day 3 of a five-day 100-km race, and we couldn’t go on. Our group of 10 was in a small lodge in Sandakphu, a tiny village on the border of India and Nepal. It had been raining all night, endless streams of water that poured down the mountainside. So when it cleared at 2 pm, without pausing to consider much, we donned our caps and coats and mufflers and our rain gear, and set off running on the trail towards Phalut. A brief drizzle began, but we ran nonetheless. The mist had cleared and the views of the dark green conifer covered valleys and the mountains were magnificent. Which one was Mt. Makalu, which one was Mt. Lhotse? And in the distance, race director Ram Sethu and guide Pemba Sherpa pointed out, was the highest mountain in the world Mount Everest. Running back to the lodge a few hours later, exhausted, breathless at 12,000 feet, we made a stop. Leaving the trail behind, we climbed up, and up. The hut that emerged, on top of the windswept grassy knoll, was a simple one. Outside a little boy ran circles around a yak. Inside was cool and dark. Cooking utensils hung from the ceiling. In the corner was a bed, a fireplace. Carl, Nancy, Sunita, Priya and I sat inside, while Ram, Pemba and the other guides walked around outside. “You must have tea,” our village woman host smiled and put a saucepan on the stove. So wonderful was the prospect, that we just smiled happily. We didn’t protest, not even a tiny token, though it is polite to do so. At least the first time. Instead we watched in fascination and in happy anticipation, as the water in saucepan boiled, with tea leaves and sugar and thick yak milk. The prospect of a cup of tea had never seemed more alluring, even life affirming. When it was ready, glasses of the steaming hot chai were passed around. It was different to any other tea I’ve ever drunk – hot and sweet but also a little salty with the unusual flavour of yak milk. “Come out,” called Ram, “the clouds have cleared.” So clutching our tea glasses in both hands we each stepped out, onto the mountainside. The sky outside was a rosy pink, and in the distance were revealed the mighty Himalayan peaks. Standing there, drinking in the chai, and the view, I knew for sure, that this was the most wonderful cup of tea I would ever drink.